I have to admit that I have not eaten candy laces in, hmm, decades? And they were never one of my favorite things even as a child. I even had to ask my assistant whether it was normal that these are hollow in the middle. He assures me that this is how candy laces are. Well, now, isn’t that cool – so long and skinny and yet hollow in the middle! If you run into someone who’s just arrived, like, from Mars, and would find this as surprising as I do, tell them they should definitely check this out. As for the taste – yeah, like toffee. Vaguely butterscotchy, although definitely artificial – there’s no real butter or anything in them. I mean, you’re not expecting miracles with something like this. The texture is fine, a little chewy, not at all gummy. Now I see that maybe I would have liked candy laces as a child if they hadn’t come in such horrible flavors. I would not buy these again, because I can think of better ways to consume butterscotch flavor, but they are cheap and worth a try. And, like in the photo, they look exactly like spaghetti. There has to be some cake-decorating or craft application that this would be useful for. If you can figure out a reason to decorate a cake with a plate of spaghetti, you should definitely go get some of these, and even more definitely, send us a picture. Toffee flavor laces?! I’d try it… if I ever get into an Ikea I’ll pick these up! is it just me, or do these rats look entirely phallic? Fortunately, that effect goes away when you see the whole rat with a tail on the other end. Although they don’t look that much like rats either. 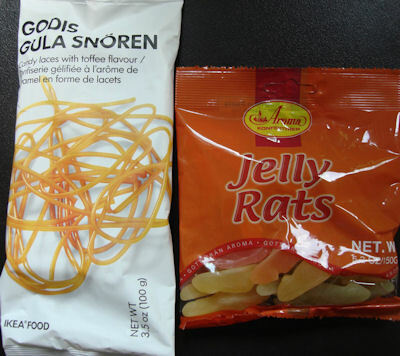 I saw the jelly rats the other day at Ikea and I was extremely curious about them but decided against getting them. I havent tried any Ikea candy before, so I didnt want to risk it with this. But after reading this post, I actually wanna go back and try them now!